Cutaneous T-cell lymphoma (CTCL) is the most common primary cutaneous lymphoma but rarely encountered. It is often misdiagnosed with allergic or infectious dermatological conditions and is usually a diagnosis of exclusion. The subsets of CTCL primarily consist of CD4 + and CD30 + lymphoproliferative disorders including mycoses fungoides. 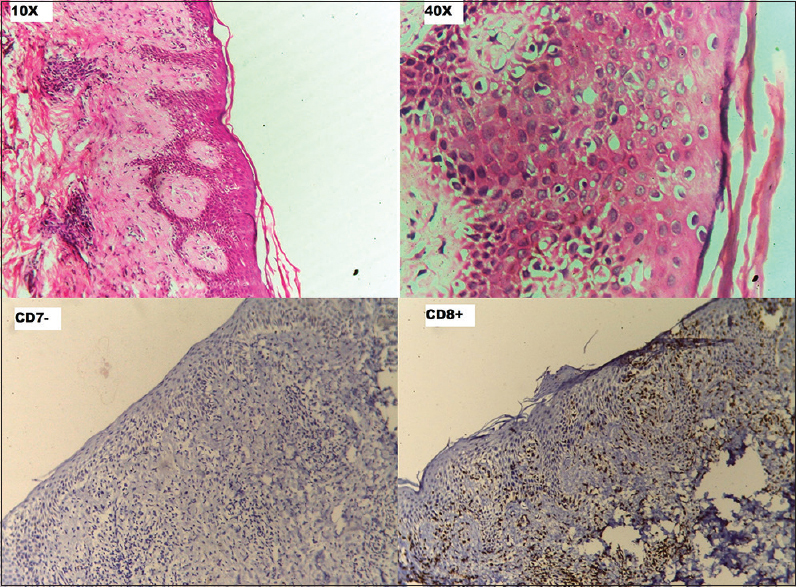 Herein, we report a case of CD 8 + ve CTCL stage IA that was previously misdiagnosed with cutaneous tuberculosis with no response to antitubercular therapy. After a confirmatory diagnosis of CTCL with multiple sites involved, he was treated with definitive local radiotherapy alone and had a complete response to treatment with no recurrence at 5 year's follow-up. Cutaneous T-cell lymphomas (CTCLs) are a group of histologic variants of the Non-Hodgkin's lymphomas which display a characteristic localization of malignant lymphocytes to the skin. The most common of these is mycosis fungoides (MF) which constitute 54% of all cases of CTCL. Primary cutaneous peripheral T-cell lymphomas and cutaneous CD30 + T-cell lymphoproliferative disorders are other common subtypes. Lymphocytes are the most radiosensitive of all cells. Hence, radiotherapy (RT) should be a possible treatment option for these malignancies. In fact, RT is one of the most effective treatment modalities for CTCL and gives satisfactory and durable local responses even at low doses, with minimal side effects. It can be used alone for curative treatment of patients with a single lesion or closely packed multiple lesions, though such patients are rarely encountered in the clinic. RT to the entire skin can be used for the treatment of patients with more advanced and widespread cutaneous lesions. RT can also be used for palliation of symptomatic nodal or visceral disease if required. This case report presents one such case which was misdiagnosed and incorrectly treated for 2 years, due to clinical presentation resembling many other dermatological conditions and nonconfirmatory findings in the first biopsy report. After confirmation of CD8 + ve CTCL stage IA with two widely separated lesions, he was treated with definitive RT only and showed complete resolution of the lesion with no recurrence at 5 years' follow-up. A 34-year-old male, soldier by profession, presented with a single reddish asymptomatic patch on the left side of the lower back for 2 years. It was the size of his thumbprint to begin with and then started to increase gradually over the next 2 years. It was not associated with pain/itching/loss of sensation/burning sensation. It was treated with topical antifungal, corticosteroid drugs in dermatology clinics, but there was no improvement seen over 1 year of period. Skin biopsy of histopathology sent after 1 year of the appearance of patch revealed features resembling cutaneous tuberculosis and patient was put on antitubercular treatment for 1 year. However, the patch remained static for a few months and then started to grow in size. Second skin biopsy sent after 2 years of the occurrence of patch revealed CTCL with CD-8 cells positive and then the patient was referred to us for RT treatment. When the patient presented to us, his general and systemic examination did not reveal any abnormality. Local examination revealed a single 15 cm × 10 cm sized oval, hyperpigmented patch on the left side of the lower back with slight erythema around it. The overlying skin was rough, scaly, slightly thickened and showing two scars from previous biopsies. It was nontender and not associated with any loss of sensation or burning sensation on palpation [Figure 1]a. Another similar lesion about 3 cm × 2 cm was also noticed on the frontal region of his scalp [Figure 1]c.
Hematological and biochemical investigations were within normal limits. Peripheral blood smear did not show séz ary cells. Ultrasonography of the abdomen did not reveal any lymphadenopathy or other abnormality. Chest X-ray posteroanterior view was normal. Whole-body fluoro-D-glucose positron emission tomography/computed tomography scan did not reveal any abnormal lesion. The histopathology of biopsies from both the lesions revealed basal acantholysis of epidermis with exocytosis and epidermotropism of lymphocytes with basal cell vacuolation. Dermoepidermal junction showed dense band-like infiltrate of lymphocytes, infiltrating to epidermis and aggregating around blood vessels and adnexal structures. Immunohistochemistry revealed the specimen to be positive for CD-2, CD-3, CD-4, CD-5, and CD-8 cells suggestive of CTCL (CD-8 positive) [Figure 2]. The patient was treated with local external beam RT on a Primus Linear Accelerator using 12 MeV electrons with a dose of 36 Gy in 18 fractions prescribed to a depth of 4 mm from the surface to both the sites [Figure 3]. At the end of 8 weeks of treatment, the patches had resolved to leave behind mottled hyper and hypopigmentation [Figure 1]b and [Figure 1]d. The patient was called for follow-up every 3 monthly for the next 2 years and then every year for the next 3 years. At the end of the 5th year, the patch had resolved completely without any residual pigmentation or recurrence of the lesion or occurrence of new lesion somewhere else on the body. Thus, the patient has achieved a disease-free survival (DFS) of 5 years. As per the revised staging of MF given by the International Society for Cutaneous Lymphomas and the European organization for research and treatment of cancer, patches or plaques covering < 10% of the body surface area, without significant blood, nodal, or visceral involvement are clinically staged as IA. These patients have a good prognosis with their survival being similar to age-matched nonMF controls. A subset of stage IA referred to as “minimal” IA, includes patients who have either a solitary lesion or a few small lesions that are either contiguous or clustered together. This is a very early stage of the disease when it is commonly misdiagnosed with a benign skin disorder. Rarely, when MF is picked up this early, treatment options are primarily local RT with other options being topical therapy with nitrogen mustards, corticosteroids, bexarotene, or phototherapy with ultraviolet A or B. The intent of treatment in these early cases is long-term disease control. However, MF patients are more commonly seen with widespread and diffuse lesions where the aim of treatment is palliation of symptoms and local disease control. Total skin electron therapy (TSET) or systemic therapy is the mainstays of treatment in these advanced stages. Even in patients with diffuse presentations, RT can produce a very effective and satisfying response when used for palliation of lesions that are painful, pruritic, or oozing. Tumors and thick plaques that are cosmetically disfiguring, especially over the head-and-neck area, can also be treated with local RT with dramatic results. In our patient, though the total surface area of the body covered by the lesions was <10%, the two lesions were not contiguous. With such widely separated lesions, the standard of treatment is TSET rather than local RT. However, due to the significant toxicity associated with TSET and the specialized nature of the treatment, to which the patient did not have access, it was decided at a multimodality forum to offer the patient local RT at both sites. He was kept under close follow-up posttreatment. The lesions responded completely to RT, and the patient has remained in remission for 5 years since treatment. In a retrospective study by Kim et al., 121 MF patients with clinical stage IA were treated with RT were followed up for 32 years. Only three patients (2%) died of MF, and the median survival of the entire cohort was not achieved at the completion of the study. Patients with unilesional disease or up to three close lesions (“minimal” IA) had an extremely favorable prognosis and were able to achieve long-term disease remissions and possibly even cures with local RT alone. In a smaller study of 15 patients with minimal stage MF, 95% of patients had a complete response (CR) to local RT and partial response in the remaining 5%. The median RT dose used was 22 Gy and the 10-year relapse-free rate was 51%. Similarly, Wilson et al. achieved a CR rate of 97% in 21 patients with minimal MF managed with localized RT. DFS was 64% at 10 years for the entire study population but was higher for patients with a single lesion (85%) and those receiving at least 20 Gy (91%). Eighteen patients with unilesional stage IA MF and treated with 30.6 Gy of local RT were described by Micaily et al. The CR rate reported was 100% with overall survival of 100% at 10 years. The DFS at 10 years was 86% with two patients suffering a relapse at distant skin sites. They were both treated with topical nitrogen mustard. With observations over the years, it is established that a dose-response relationship clearly exists with higher doses resulting in higher rates of CR and local control. In a study of the effect of RT dose on local control of 111 MF lesions (53% plaques and 47% tumors) by Cotter et al., CR was achieved in all lesions receiving a dose more than 20 Gy. There was an inverse association between the dose and the local recurrence. For doses of 10 Gy or less, the in-field recurrence rate was 42%, while for doses between 10–20 Gy, it was 32%. It further reduced to 21% for doses between 20–30 Gy and to 0% for a dose of more than 30 Gy. Similar response rates were seen for both plaques and tumors. Based on this study, it was suggested that a tumor dose equivalent to 30 Gy at 2 Gy per fraction was required for acceptable control of MF lesions. When the goal of treatment is palliation of symptoms, shorter courses of RT are equally effective as longer ones and are more practical and convenient as they reduce hospital visits and cost of treatment. In a retrospective study by Thomas et al., 58 patients of CTCL (primarily MF) were treated using a single fraction of palliative RT with 97% of the receiving a dose of 7 Gy or more. Twenty-one (36%) patients had patches/plaques, 34 (59%) had tumors, and 3 (5%) had erythroderma. About 94% lesions demonstrated a CR, and at 42 months, the rate of in-field relapse was 1%. In another study, 82 MF lesions in 31 patients were treated by Neelis et al. with local RT with either 4 Gy or 8 Gy in two fractions. Only 30% of the 17 lesions treated with the 4 Gy regimen showed any response while the 65 lesions treated with the 8 Gy schedule showed a CR rate of 92%. Patients who failed to respond to the initial treatment completely or relapsed were further treated with local RT to a dose of 20 Gy in eight fractions. They did not develop any major acute or chronic radiation-related toxicities. To summarize, local RT is an extremely effective modality for both local control as well as palliation of CTCLs. The dose and fractionation to be used can be decided depending on the stage of disease, size, and number of lesions as well as the intended goal of the treatment. Patients with more widespread or diffuse MF should be offered TSET. Such treatment should be carried out only at centers which are specialized and experienced in carrying out this complex treatment. Malignant Disease Treatment Centre, Command Hospital (SC), Pune, India. Bradford PT, Devesa SS, Anderson WF, Toro JR. Cutaneous lymphoma incidence patterns in the United States: A population-based study of 3884 cases. Blood 2009;113:5064-73. Kim YH, Jensen RA, Watanabe GL, Varghese A, Hoppe RT. Clinical stage IA (limited patch and plaque) mycosis fungoides. A long-term outcome analysis. Arch Dermatol 1996;132:1309-13. Tandberg DJ, Craciunescu O, Kelsey CR. Radiation therapy for cutaneous T-cell lymphomas. Dermatol Clin 2015;33:703-13. Piccinno R, Caccialanza M, Percivalle S. Minimal stage IA mycosis fungoides. Results of radiotherapy in 15 patients. J Dermatolog Treat 2009;20:165-8. Wilson LD, Kacinski BM, Jones GW. Local superficial radiotherapy in the management of minimal stage IA cutaneous T-cell lymphoma (mycosis fungoides). Int J Radiat Oncol Biol Phys 1998;40:109-15. Micaily B, Miyamoto C, Kantor G, Lessin S, Rook A, Brady L, et al. 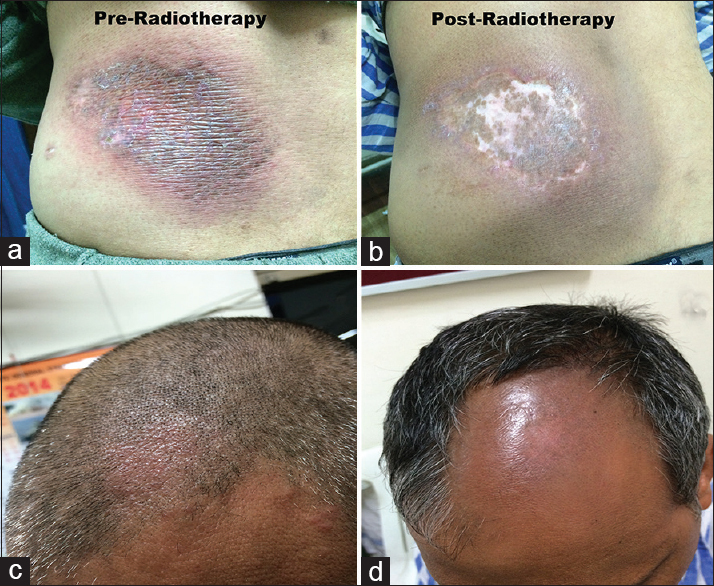 Radiotherapy for unilesional mycosis fungoides. Int J Radiat Oncol Biol Phys 1998;42:361-4. Cotter GW, Baglan RJ, Wasserman TH, Mill W. Palliative radiation treatment of cutaneous mycosis fungoides – a dose response. Int J Radiat Oncol Biol Phys 1983;9:1477-80. Thomas TO, Agrawal P, Guitart J, Rosen ST, Rademaker AW, Querfeld C, et al. Outcome of patients treated with a single-fraction dose of palliative radiation for cutaneous T-cell lymphoma. Int J Radiat Oncol Biol Phys 2013;85:747-53. Neelis KJ, Schimmel EC, Vermeer MH, Senff NJ, Willemze R, Noordijk EM, et al. 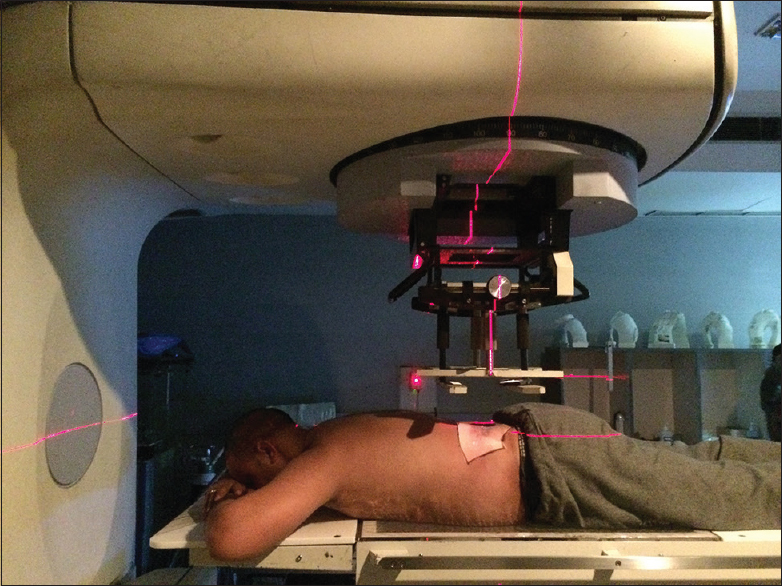 Low-dose palliative radiotherapy for cutaneous B- and T-cell lymphomas. Int J Radiat Oncol Biol Phys 2009;74:154-8.